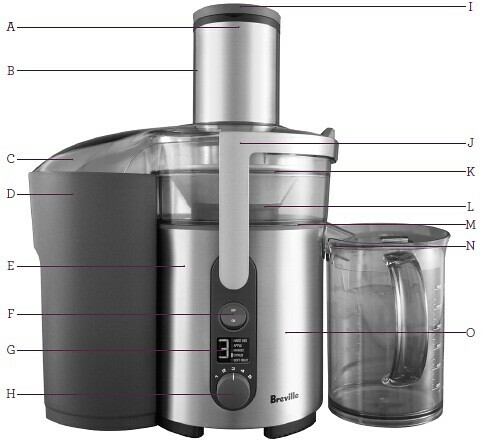 The Juice Fountain® Multi-Speed — A smart juicer that adjusts speeds to maximize juice and minimize waste. 5 speeds from 6500 to 12500 RPM for efficient juice output. Easy-to-clean micro-mesh filter keeps the fibers out and the juice in. A. Unique Direct Central Feed System - ensures maximum juice extraction. B. 3 Inch Wide Feed Chute - fits larger fruits and vegetables whole. C. Juice Cover. D. 3 Liter Pulp Container. E. Stylish Stainless Steel Design. F. ON/OFF Switch. G. LCD Speed Indicator - with juicing speed guide. H. Electronic Variable Speed Control Dial. I. Food Pusher - for pushing whole fruit and vegetables down the feed chute. J. Die-Case Metal Interlocking Safety Arm - stops the juicer operating without the juicer cover locked in place. K. Nutri Disc™. L. Motor Drive Coupling. M. Filter Bowl Surround. 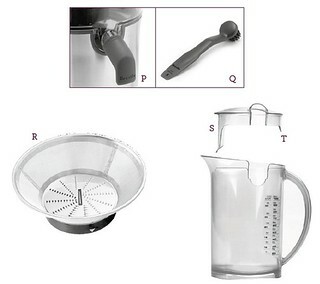 N. 1.2 Liter Juice Jug and Lid - with built-in froth separator. O. Heavy duty Motor - with one year warranty. P. Custom Designed Juice Nozzle - perfect for mess free juicing straight into a glass. Q. Cleaning Brush - flat end of brush assists in removal of pulp from the pulp container and nylon brush end makes for easy cleaning of the Nutri Disc™. R. Nurti Disc™ - Allows you to extract only the juice from fruit and vegetables. 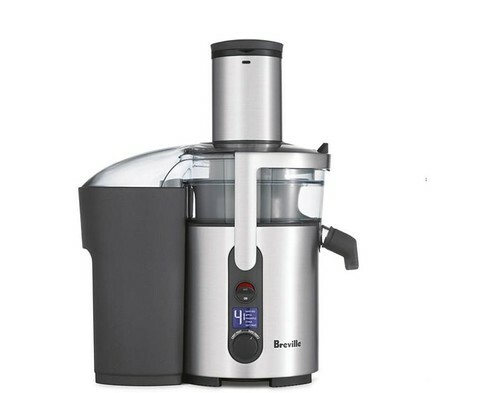 S. Built-In Froth Separator - ensures juice froth is separated from juice when poured. T. Juice Jug Lid - allows juicer to operate with the lid on, eliminating any splatter during operation.